Posted by V the K at 10:23 am - April 12, 2018. I am sort of missing the connection between the Cookie Monster and knife crime. Or is it just leftist instinct to infantilize everything? Really, would you ever see anything like this in a society run by reasoning adults, except as satire? And only cowards carry screwdrivers? WTAF. The Cookie Monster is happily branding certain, unidentified people as “cowards.” O-o-o-h, that stings!!!! The nanny state has pulled out the really, really big, nuclear rail guns on this one. I was going to walk down the street with a broken wine bottle and attack someone, but if it pisses off the Cookie Monster, I will not do it. You can all me a “coward” and I will show you that I am not a coward. You can make me aware and even “woke” but I will still do the big dirty. It is the Cookie Monster that stops me in my tracks and makes be a better and aware coward. Yessiree, the nanny state has me by the balls now. 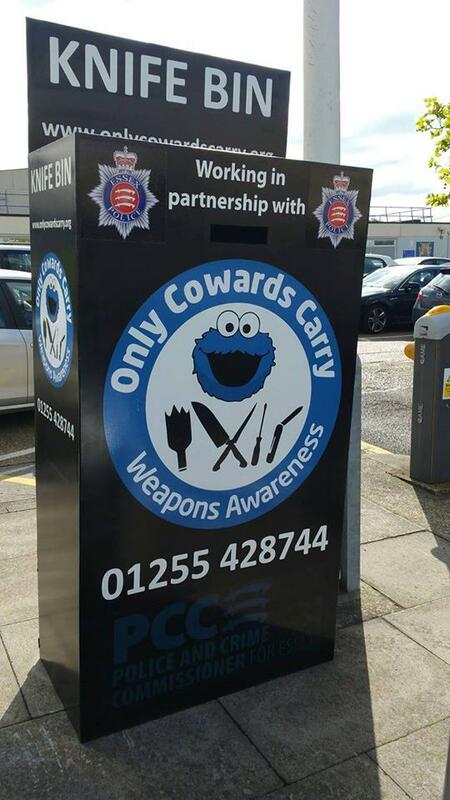 Sorry Essex Police and Cookie Monster, I find a pen knife or Swiss Army knife useful for all sorts of legal things, and I intend to keep carrying one. It has nothing to do with whether I am a coward or not. Ted B. (#1) Didn’t he also say something like “Democracy is the worst form of government–except for all the other forms….”? So all owners of hardware stores (as well as Home Depot and Lowe’s) are cowards??? Yeah, only a cowardly 5’2 woman would ever carry when walking alone at night. The Progressive Circle of Life: Create stupid laws based on “feelings”; laws are routinely ignored; creating disrespect for the Rule of Law; more laws to curb the ‘disrespectful’ behavior; repeat. As Martin Luther once said, thinking that all men can be governed by Christian law is as insane as penning wolves with sheep, and telling the wolves to start eating glass. Thank you, London, for serving as an object lesson on the innate savagery of humanity. Once cutting and piercing instruments are banned, they will resort to blunt instruments. And once those are banned, hands and teeth. And so the attempt to lift Man out of the mire of Nature will accomplish nothing but convince him to immerse himself fully in it once more. Only cowards carry tennis rackets. Sean L, it’s acid attacks, not blunt instruments. London has now become the world leader in acid attacks. The Cookie Monster appears because baking cookies usually involves a spatula and spatula crime is out of control. And then there are rolling pins. @5: I just read that Bank of America was going to stop granting loans to manufacturers of “military style” guns sold to the public. BofA has no plans to discontinue armed security in some of its locations. If the knife panic catches on here, I expect BofA to stop providing financing to the cutlery industry (except for those manufacturers that produce only spoons). Planned Parenthood accepts credit cards (remember when VISA was BankAmericard?) and I’d bet that BofA provides financing to companies in all sorts of less-than-genteel lines of business. If business wants to get into this sort of thing then anything becomes fair game. For instance, we could talk about the usurious interest rates BofA and the other banksters charge people already in over their heads (yes, I know why that is – just trying to make a point). So that means they hate the poor and, based on what the SJWs tell us the banksters *really* hate people of color. The good news is the knife controllers won’t have to pry any knives out of cold dead hands, since the butter tends to make them a little more slippery.